Season a pot of boiling water generously with salt. Add penne and cook until just shy of al dente, approx. 1 min. less than the package recommends. Drain, reserving approx. 1/4 cup (60ml) of pasta water. While the pasta cooks, mince the garlic. Add olive oil to a large frying pan and add minced garlic and chili flakes. Sauté for approx. 3 min. over medium heat, then add tomato paste and canned chopped tomatoes. Let simmer for approx. 5 min. Add reserved pasta water and cooked penne to the tomato sauce. Toss over medium heat until the pasta is coated in the sauce. Season with salt if needed. 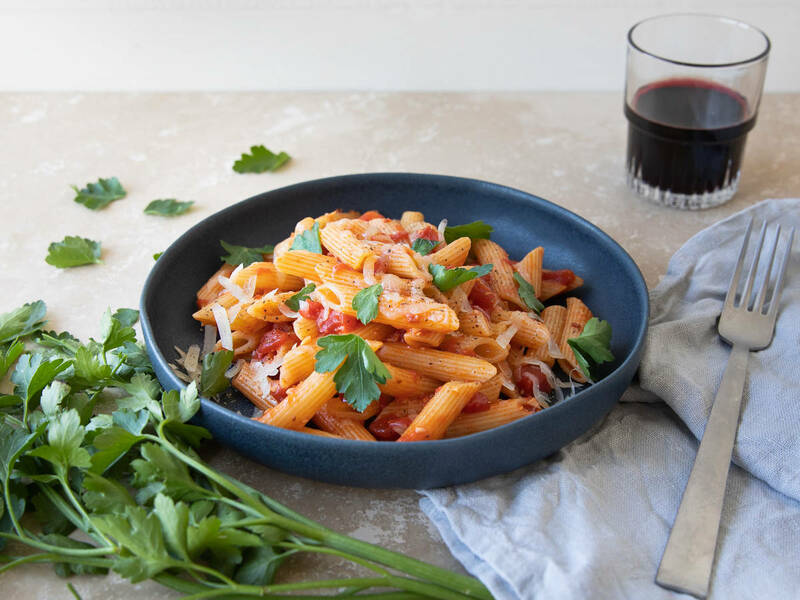 Serve immediately with freshly grated Pecorino cheese, a drizzle of olive oil, and parsley. Enjoy!